What If I Don't Want To Be A Submissive Wife And Serve Others? 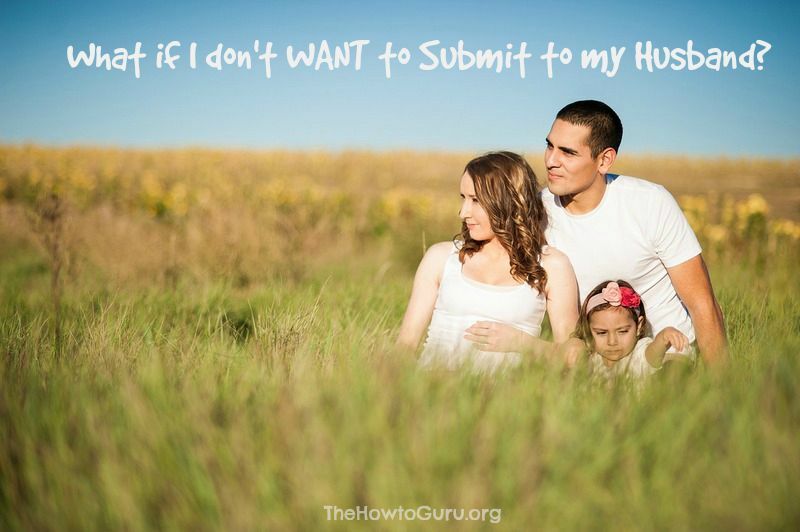 What If I Don’t Want To Be A Submissive Wife And Put My Husband First??? Do I have to be a submissive wife? WARNING: Following the steps of a submissive wife below may result in extreme closeness to your Savior and your spouse. Please proceed with caution. We were a young couple that had moved to a small, Mayberry-ish town and we soon became regulars at a little bitty church. I can distinctly remember my ears perking up one day as the preacher mentioned something about being a submissive wife. I was quite flabbergasted! I mean, of all the “spiritual things” to talk about, why in the world would he start talking about submission in marriage? We were new to the idea of truly living out our faith as a couple and were learning so much, but wow, this preacher man was getting all up in my business! I had grown up in the neighboring town and was pretty successful at the businesswoman thing. I loved my husband and kiddo, worked hard, and was a very independent woman who prided myself in the ability to do things people told me that I couldn’t do. I wanted it all. Wasn’t this idea of a submissive wife just an old-fashioned notion? Truth be told, I was a book of knowledge about the latest beauty trends, TV shows, and lives of celebrity couples gracing the cover of People Magazine. I knew how to work hard and be kind, but it became obvious that I knew little about God’s Word and His heart for marriage. I started searching the scriptures in hopes that I’d find a loophole of some sort that would get me out of this uncomfortable idea of being a submissive wife that had been a part of that stirring sermon. The truth was staring back at me on the pages of my rarely-read bible. As it turns out, the preacher had been right on point and the Lord was convicting me of my selfish and self-sufficient attitude. That week, I privately committed to learning more about the scriptures and God’s will for my marriage. By the way, that preacher and his family went on to become some of our dearest friends. I learned many truths from God’s word from sitting under the teaching of our Brother Don. I found many scriptures about being a submissive wife that I studied in length. I was careful to not pull scriptures out randomly, but rather, I took the time to learn the context that surrounded each of these wise words. I realized that submission goes both ways between a husband and a wife and that my old idea of submission was a very worldly, warped view. I know now that women that balk at the thought of being a submissive wife don’t really understand what the bible says about it and/or they are thinking in extremes. Submissive Wife: Not about being right but obedience to my Savior and the heart of my Husband. I do not want to mislead you though, dear sister. Life did not become sugar plums and gum drops because I suddenly knew the truth of God’s word and submitted to my hubby’s leadership in our home. Submission is hard. There have been opportunities in which the Lord has given me chances to give in to my flesh or to trust my husband. It’s tougher at some times than others. One particular trial stands out in my mind where I absolutely disagreed with Superman on a punishment he had promised our oldest child if he disobeyed in a certain area. It wasn’t a physical punishment but a one that would cause our little boy to miss out on a special event. A very special event our kiddo had worked hard on. Oh, it was hard. I was upset. I cried tears in private. I was given some bad advice from one friend (that I stubbornly wanted to act on), but instead consulted an older, godly woman that I knew would not steer me away from biblical instruction. I trusted the Lord, I trusted my mentor’s godly advice, and I trusted my husband even when it was tough. You know what? It’s been many years, but I can look back now and see that my husband was absolutely right. He was the steady rock that our son needed during those formidable years when I couldn’t be so steady. Our son needed to know that his Dad is a man of his word and that he can be also. He needed to see that his parents were a united front in loving him but also in disciplining him. There are still growing pains when I flat-out disagree with the hubs. Yes, I voice my opinion and am heard, but it’s my overall attitude that has changed. I try to take a long, deep breath while summoning the holy spirit to clamp my mouth shut until rational thinking and calm words come forth. (I’m still not perfect at this by the way). As an older Wife and Mom now, I can look back and see God’s hand over us and His faithfulness to help me learn to trust Him, trust my husband more, and look at things with a new perspective. That part has definitely gotten easier. Our oldest grew up to be a respectful young man who now appreciates that we put in the hard times to make sure he learned the right lessons. It’s still a work in progress for me, but there are 5 things that have helped me learn how to become a submissive wife (even when I didn’t always want to). I know that you think I’m going to tell you that you should run, not walk to the godliest woman you know and ask for her advice. Not necessarily. No, initially we must refrain from running to friends and family over every little disagreement. That can get ugly. What I am suggesting that we do as wives is to first run to the Lord. Take it to the unbiased, all-knowing Father that loves you and your husband more than anyone else. Simplistic as it sounds, crying out to the Lord to help you even before problems arise would be a tremendous blessing to your marriage. Yes, God knows your thoughts, but He wants to hear from you similar to how Moms for their kids to ask for help when they need it. Pour out your heart to Him and He will direct your paths. If you do eventually seek out the listening ears and consul of others, please be careful who you choose. Taking advice from immature Christian women could be devastating. Only share and ask for advice from godly women that you know will steer you alongside God’s word whether you want to hear it or not. God gave us the bible as our guidebook – so use it! Dig into His always perfect, inspiring, sometimes comforting, sometimes convicting, Word. God brings scripture to my mind sometimes that I’ve read in the past that offers solutions. Sometimes I’ll read a new scripture and it’s so relevant that I am in awe with an overflowing heart. I’ve written a great deal about how wives can fit in ‘God time’ in our crazy lives and how to bless your man when it’s tough in my new book. It’s free to you here on the blog. You should protect your heart from the evil around you. The bible says in Proverbs 4:23 to “watch over your heart with all diligence, for from it flow the springs of life.” From the heart comes pretty much all that we say and do, decisions that we make, and outlooks we have on things of this world. We protect everything else tangible that we have, but have little regard to these words of wisdom about guarding our hearts. Filling our hearts with ungodly media moves us away from God’s will for our marriage. I don’t care what Disney and Hallmark tell you, but we can’t just follow our hearts and trust what “feels” good. Jeremiah 17:9 tells us that our hearts are deceiving and not trustworthy. Especially the roller-coaster-come-to-town emotions of a woman’s heart. Mainstream population nor Hollywood will support your decision to pass on the media trash (even some church folk), so you are going to have to be strong in your conviction. I know those words will be like pouring hot coals over some of your heads, but I want you to hear me out: First, I’m talking about the act of thinking of him and putting what he physically, mentally, and emotionally needs before the needs of yourself. Don’t go extreme on me – I don’t mean that you become some pitiful little slave girl who is waiting on him constantly. That’s what the world says submission is. They are wrong. Biblical submission is shared by husband and wife. I’m talking about a woman after God’s own heart that’s willing to go the extra mile to be his helper and love him like God intended. Secondly, I am saying that the “big picture” of your relationship as a couple comes before the pleasure of your children. There are many scenarios but for example, don’t get so focused on running the lives of your children to and fro that you leave no space for your man. Or, hear out his reasoning on a discipline of the kids you don’t agree with instead of arguing about it in front of the kids. LOOK for opportunities to make your husband feel special and not just as a tag-along with you and the kids. I know this one is hard. There is an unbelievable bond between a Mother and her children, but we have to keep it all in balance. It’s easy to put that Hubster on the back burner and keep all of our attention on the babes. Yes, the children need your love and attention to show them how special they are. Some seasons of your life, the kiddos will need more attention and care than others. Here’s the thing, though: If you let them, the kids will STAY on the center stage and good old Dad gets leftovers of your energy. You know what I’m talking about! One day your kids will be gone and there you will be in an empty house with a man you barely know…..
I’m thinking that that’s not quite what God had in mind for marriage, do you? Concerning the discipline of your children, you better be united honey, or the ship’s gonna have lots of holes to fill before it goes down. This is a lesson that had to be practiced for me, but it solves so many issues. It’s not convenient and it’s not always easy, but take the time to talk to your husband about things before you speak with the kids about it. Learn as a couple to take turns compromising about major decisions. It’s been said that there is no better gift to children than for their parents to truly love and respect each other. I’ll add that putting the Lord first in marriage, and then putting each other in second place is a gift also. Kids need to see the devotion and trust that you share with their Dad. Seeing you united as a front when their sneaky, little selves try to divide and conquer you when they want their way. Mark my words, wonderful kids they may be but they will naturally play you against your hubby, and if you aren’t careful, many problems in the homestead will ensue. Children need steadfastness and stability when it comes to discipline and believing in the word of their parents. It matters. Yes, you should pick your battles. Yes, you should discipline differently according to the crime. Yes, you need to stand by your husband when he lays down the law in disciplining the kids. I pray this is a blessing for those who want to know more about how to become a submissive wife. Don’t give up ….. It’s worth it. What’s the hardest part of being a submissive wife? Previous Post 7 Reasons For A Family Travel Vacation To Marineland This Year! Next Post Woah! Tenth Grade At The Homestead? If we as women of God choose to look at a Biblical principle through worldly eyes, we will never submit in the way God has planned for us. His way is the best way in all areas of our lives. you are on track with your life and marriage. Very happy for you and your family. Pingback: New Year's Day Confessions + Why I'm Not BLOGGING Anymore!